Several books have been written over the years on Golden Age 3-D movies which contain a great deal of wrong information. Unfortunately, that erroneous information has been copied and spread throughout the Internet. In many cases, that myth has now become fact. For the past 22 years, we have searched with a fine tooth comb through studio correspondence and production files as well as industry trade journals from the period of 1951 - 1955. Utilizing documented, primary source materials such as Daily Variety, Boxoffice, Hollywood Reporter, American Cinematographer, Exhibitor, Motion Picture Herald, Film Daily, Showman’s Trade Review, Film Bulletin, Motion Picture Daily, Harrison's Reports, International Sound Technician and other industry journals, we are able to document this period of technological development (including widescreen and stereophonic sound) on a daily basis. The information and articles shared on this site will be taken from those original materials and will accurately present the facts. If you utilize our site for research purposes, please credit your source and link to our website. 1. 3-D films of the 1950’s were viewed through red and green/cyan glasses. Not true. Except for three Lippert shorts and a group of burlesque shorts presented in anaglyphic form in 1953/54, all of the 3-D features, shorts, and cartoons exhibited in commercial theaters from 1952 through 1955 were projected using polarized light. The glasses had colorless lenses exactly like today’s major 3-D films. 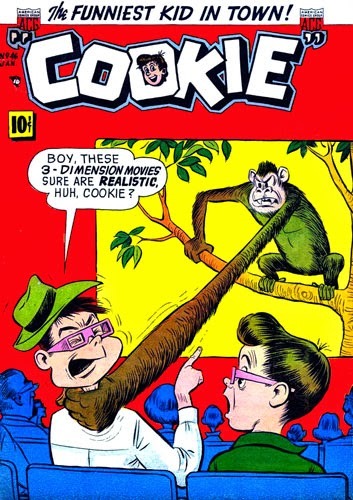 When anaglyphic comics appeared in the last quarter of 1953, the colored 3-D glasses became commonplace. Colored lenses are much more memorable than the colorless polarized lenses used to view 3-D films. Comic books read by a young child over 58 years ago can easily cause confusion with memories of seeing the movies in anaglyphic 3-D. 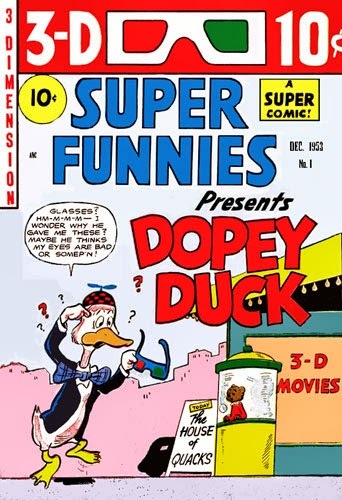 Even some covers clouded the issue, such as the December 1953 SUPER FUNNIES with Dopey Duck seeing "The House of Quacks" or the February 1954 issue of WONDER WOMAN with a monster leaping out of the screen. However, a few were accurate showing polarized glasses, such as the January 1954 COOKIE and the September 1954 LEAVE IT TO BINKY. Visit the Comic Books page for the complete story as well as our restored anaglyphic and cover gallery. The first polarized 3-D film from the 1950's converted to red/cyan anaglyphic was the 3 Stooges short, SPOOKS. Columbia released two sixty foot 8mm Headline editions in August 1965. Some features (Creature from the Black Lagoon, It Came from Outer Space, The Maze, Robot Monster, The Mad Magician) were converted to anaglyphic 3-D in the 1970's for re-issue. Others (Miss Sadie Thompson, Bwana Devil, Gorilla at Large, Revenge of the Creature, Hondo) were converted in the 1980's for television broadcast. All were originally shown theatrically in polarized 3-D.
Click here for a complete list of the anaglyphic 3-D films presented in 1953/54. 2. 3-D glasses cause eyestrain/headaches. Improper camera 3-D technique – This is especially critical in 3-D films since the image is magnified so much, which magnifies errors. 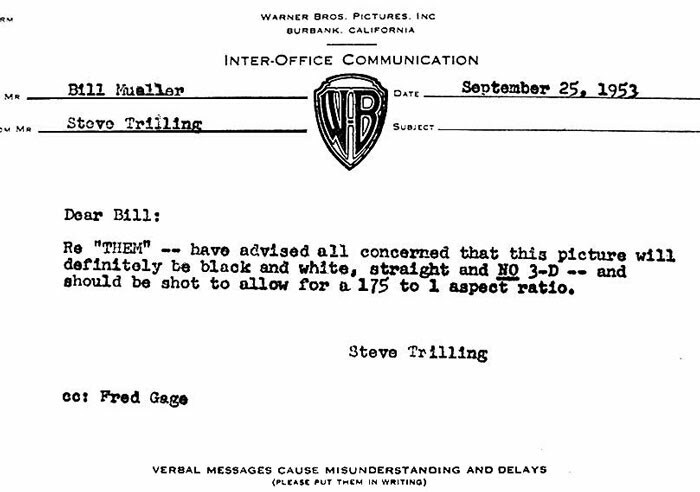 The majority of the films of the 1950’s were surprisingly well shot, technically. This is largely because some of the finest technicians of all time staffed the camera departments during those studio days. Interaxial, convergence, and minimal vertical misalignment were very well done for the most part. Improper projection technique – Keeping the projectors in correct synchronization and phase is critical; unfortunately, these standards were frequently ignored. Projection alignment, as well as the brightness of the image (often too dim causing eyestrain) was a big problem. The Polaroid Corporation did some field tests in the fall of 1953 and discovered that 50% of 3-D presentations in theaters were either out-of-sync or out-of-phase. This was the primary reason 3-D movies died such a quick death at the box-office. Eyes – We all see 3-D differently. It is highly subjective. Roughly 10% of us cannot see 3-D well, or at all, and some are bothered by seeing 3-D images. Some of the latter is from eye problems that are quite common. As we get older, the eyes have more issues with 3-D because 3-D exercises the eyes. The exercise, like any other, can lead to fatigue and even eyestrain. 3. BWANA DEVIL was the first 3-D feature film. Not true. The publicity for BWANA DEVIL stated: The World’s First Feature in Natural Vision 3-Dimension. This statement is true; the key being the words “Natural Vision,” the trade name of the 3-D equipment used to shoot the film. In later years, the film’s writer/producer/director Arch Oboler was surprised to learn it was not first. He really believed it. The first feature 3-D motion picture was THE POWER OF LOVE (SEPT 1922). However, BWANA was the first 3-D feature film to have international exhibition. 4. 3-D Movies were "cheesy" exploitation films with lower string talent. Not true. Here's a partial list of some big stars that appeared in front of the 3-D camera: John Wayne, Rita Hayworth, Kathryn Grayson, Howard Keel, Bob Fosse, Robert Mitchum, Linda Darnell, Jack Palance, Edward G. Robinson, Dean Martin, Jerry Lewis, Jane Russell, Ray Milland, Grace Kelly, Victor Mature, Robert Stack, Jose Ferrer, Vincent Price, Joan Fontaine, Phil Silvers, Randolph Scott, Charles Bronson, Karl Malden, Ernest Borgnine, Rhonda Fleming, Robert Ryan, Lee Marvin, Virginia Mayo, Lee J. Cobb, Fred MacMurray, Barbara Stanwyck, Rock Hudson, etc. Not a shabby list of talent there! Great directors and cinematographers worked on these films as well, including John Alton, Raoul Walsh, Douglas Sirk, John Ford, Roy Baker, Chuck Jones, Robert Burks, George Sidney, Norman McLaren, William Cameron Menzies, Francis Coppola, Walt Disney, Jack Arnold, Budd Boetticher, Charles Roscher, Hal Wallis, Alfred Hitchcock and many more. 5. 3-D Movies of the 1950's were loaded with gimmicks to show off the process. Not true. For the most part, the filmmakers respected the "stereo window" and did not resort to gimmicks in order to enhance the process. The only studio guilty of excessive exploitation would have been Columbia, and more specifically the William Castle/Sam Katzman productions. However, for every film that was guilty of throwing an overabundance of objects at the camera (FORT TI, CHARGE AT FEATHER RIVER, MAN IN THE DARK, SPOOKS) there were many, many others which utilized great restraint in their use of the process. Check out the superb cinematography on HONDO, SECOND CHANCE, I THE JURY, INFERNO, MISS SADIE THOMPSON, TAZA-SON OF COCHISE and THE GLASS WEB for some excellent examples of the dimensional process. 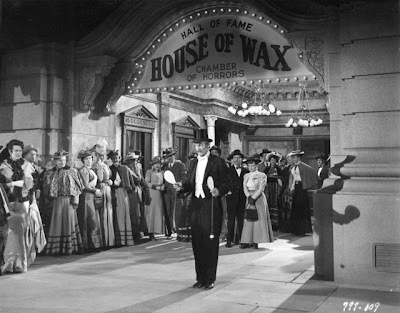 The often-cited paddleball sequence in HOUSE OF WAX was there for a very specific reason: that sequence was immediately following the intermission point. Director Andre deToth felt the barker was an effective way to bring the audience back into the story. In fact, in the following scene Vincent Price comments, "We won't need him once we're established." How true! The overuse of gimmicks became commonplace in the 1970's and 1980's with movies such as COMIN' AT YA, TREASURE OF THE FOUR CROWNS, FRIDAY THE 13TH 3-D and ANDY WARHOL'S FRANKENSTEIN. 6. Too many bad movies killed off 3-D in 1950s. Not true. There were exactly 50 movies made (in English) in 3-D during the Golden Age. While there were certainly some bad and mediocre films in this group (ROBOT MONSTER, CAT-WOMEN OF THE MOON, and HANNAH LEE, to name a few), there was also: KISS ME KATE, HOUSE OF WAX, DIAL M FOR MURDER, CREATURE FROM THE BLACK LAGOON, and so on. 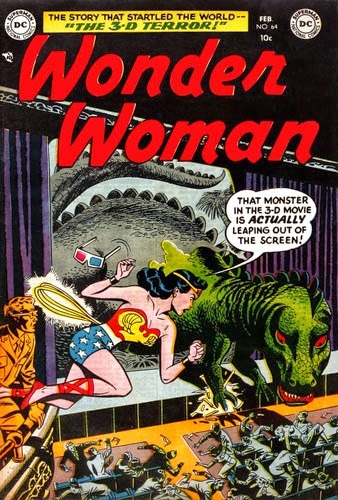 The 3-D movies of the Golden Age were certainly no better or worse than any other group of films. Click here to learn what killed 3-D movies in the 1950's. 7. 3-D Movies of the 1950's were not in widescreen. Major theaters began installing new screens in the summer of 1953. A 12/5/53 survey of 16,753 operating indoor domestic theaters showed that 80% of downtown theaters and 69% of neighborhood theaters had installed widescreens. In total, 58% of all U.S. theaters had gone widescreen by the end of 1953. The conversion was slow in the Southern and North central parts of the country and that’s why the films were still protected for the standard Academy ratio. For the most part, these 3-D films have not been seen in widescreen since their original theatrical play-dates over 60 years ago. Here are two original trade ads for exhibitors promoting the panoramic full stage screen. Click here to learn the facts about widescreen. 8. KISS ME KATE and HONDO were shown mostly flat in their original engagements. Not true. We've already documented the wide release of HONDO in 3-D (see the article on this site) and KATE followed the same pattern. In fact, there was such a large demand for 3-D prints of KATE that Technicolor had to strike additional left/right prints to meet the exhibitor demand. More information can be found in Kiss Me Kate. 9. DIAL M FOR MURDER was never shown in 3-D in its original release. Not true. DIAL M was shown to exhibitors and had its World Premiere in 3-D. The full story can be found on this page. 10. WAR OF THE WORLDS, INVADERS FROM MARS and THEM were filmed in 3-D.
Not true. The Natural Vision camera rig was first shown to the press and studio executives on May 29, 1951. Further demonstrations and test films were shown on July 6 and July 24, 1951. George Pal was assigned to the WAR OF THE WORLDS project in July of 1951. Pre-production continued throughout the rest of the year and filming commenced in mid-January 1952. Arch Oboler announced plans to produce the first 3-D feature film on February 4, 1952 but production on LIONS OF GULU (BWANA DEVIL) did not begin until June 18. Had George Pal desired 3-D for WAR OF THE WORLDS, the Natural Vision camera would have certainly been available during January and February of 1952. INVADERS FROM MARS began filming on September 25, 1952. There is no mention in the trades for 3-D treatment on this film. BWANA DEVIL had completed principal photography on July 12, 1952. If producer Edward L. Alperson had wanted 3-D lensing for IFM, the Natural Vision camera rig would have been available. 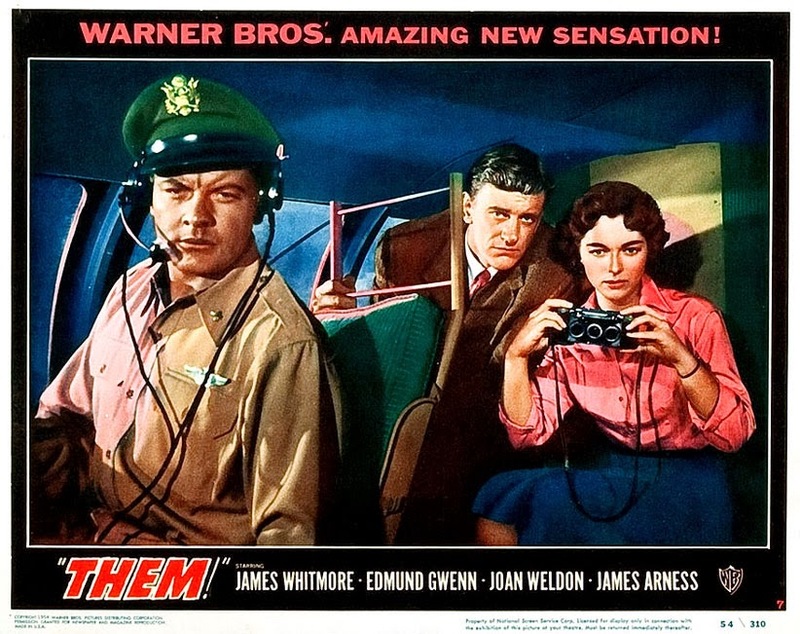 Warner Bros. announced THEM as a widescreen 3-D production in the trades but the day they were going to film a test with the giant ants, the All-Media camera rig malfunctioned and not a single 3-D frame was shot. This is documented in the studio production files. By the time filming commenced for 1.75:1 on September 29, 1953, the plans for 3-D photography had been dropped. However, Joan Weldon can be spotted using a stereo Realist in several scenes. BONUS QUESTION: Why do 1950's 3-D movies have an intermission? All Golden Age 3-D features had a built-in intermission point around the 50 minute mark. This point was known to the creative team during production so the scripts were written with an intended break at a crucial moment in the plot. Various shorts, newsreels, cartoons and trailers (either flat or 3-D) would be shown after the feature. The films were shown in polarized 3-D on two projectors with interlocked 35mm prints representing the left and right sides. The largest reels available at the time were 24-inch which could accommodate up to 5,000 feet of color film and 5,500 feet of black and white. In addition, the largest carbon arc rods used for the light source could not burn for more than an hour. The vast majority of theaters had two or three projectors in the booth so a break was necessary in order to change reels. Usually the intermission would last for 10 minutes which was enough time for the operators to re-thread both projectors and install new carbon rods. In this photograph, the standard 2000 foot projection reel is held next to the new 24-inch 5,500 foot reel required for 3-D presentations. Some of the 3-D Blu-ray releases available now include the intermission title. Here are the original intermission cards for HOUSE OF WAX and ROBOT MONSTER. Jack Theakston has just restored the lost Intermission title on Those Redheads from Seattle. Why are there occasional flat shots in vintage 3-D movies? This page has the answer.